Yes, it is possible to continue or make a fresh start this year with less expenditure and more savings. If you're wondering how to do so, then remember that savings directly depends on how less you're spending. Therefore, it is a prerequisite to plan a fresh new budget this year. 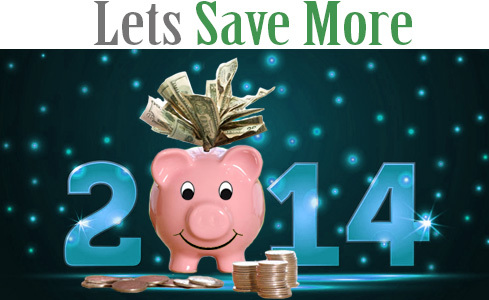 Along with that, check out these 3 important items on which you can spend less in 2014. Price reduction of cars - Market reports are pointing to the fact that the car manufacturers are likely to reduce the price of cars since the market price of used cars have reduced to some extent. Therefore, the new-car dealers might reduce the selling price of cars in order to attract consumers from the aftermarket and entice them to buy new vehicles. Comparatively cheaper cellphone service - The next thing you could spend less on is none other than cellphone service. With the wireless companies competing for customers, you've got a rather good opportunity to slash your mobile bills. In fact, a good number of wireless firms are also offering deals, especially those on the hunt for bargains. Less expensive models of tablets - Finally, if you're looking to get that most-coveted tablet, then this year provides you with the opportunity to actually spend less. Since the tablets are getting relatively cheaper. In fact, a variety of less expensive models continue to flood the market. While waiting for these changes to occur in the US financial market, there are certain other things discussed below, which you can consider and concentrate on, in order to improve your overall financial health. There is no harm in negotiating the price with your service providers, especially regarding internet and cable costs. Companies are usually competitive, so more often than not, they are ready to reduce prices than losing businesses. The providers may also come with exclusive offers without reducing the monthly cost. For example, a provider might offer you a prepaid debit card with a definite dollar amount when you sign for the service; however, the cards usually arrive with your first or second month's bill and you need to pay a penalty (in terms of certain dollar amount at a pro-rata basis) if you disconnect the service within a definite time period, say, a year. Another tip to save cost in this sphere would be to bundle services. If you are currently having three service providers for each of internet, phone and cable, then any of the companies is most likely to offer a lucrative monthly rate if you opt for bundling services together. However, like any other things, you should shop around so that you get the best possible rate along with a one-time incentive to opt for that specific service provider. Instead of getting lured by the offers in your mailbox from several credit card companies trying to entice you, do a bit of online research in order to pick the right card which will match your lifestyle. While doing the research, focus on the interest rates and the rewards offered by the credit card companies. For example, a company may offer you a certain dollar amount of cash back when you spend a certain amount within a definite period of time. This card may help you if you have a planned expenditure in next 1-2 months. Perhaps, electricity bill comprises one of the major allocations in our monthly budget plan. However, you can try some simple tricks and you'll be astonished to see your next electricity bill. One of the simplest ways is to switch off the lights when you leave house after sunset. If you don't want to do that, you can just keep one light switched on when you leave the home. Once you enter, you will have enough light to locate the switches and turn on other lights. Also, try to not switch on the AC unless it's very hot; instead, install some fans at right places. Even during winter months, you can set the temperature at 50°F and keep it in 'Auto' mode, so that the heater turns on automatically when the temperature falls below that. You can set this temperature as per your requirement. Moreover, try using your washer-dryer twice or thrice a week instead of using it daily. You can also dry your clothes, especially your expensive clothes, in a clothes line in your bathroom or any other feasible place, in order to save electricity cost and keep your clothes looking like new a bit longer. Usually in every state, there’s definite time periods, when the electricity cost is minimum. This may change with the seasons and from one provider to the other. You can plan using your big-ticket energy items during this time of the day/week in order to save energy and in turn, your hard-earned dollars. For example, early morning or during noon might be the best time to use these items. You can check out this information online. After trying these tactics for a full billing cycle, check out the electricity bill the next month and calculate how much you’ll save over the year if you continue doing so. When you want to save every extra penny to improve your financial health, then it is quite important you keep a track of your progress. To do so, you do not have to be an A-Grader in finance, only what you need is basic budgeting knowledge and ready to do simple calculations. You can download certain software in your smartphone in order to keep a track of your progress regularly. Make sure you review your budget and do the necessary calculations at least once a month. Along with checking your financial progress, it is equally important to safeguard your financial health from fraudulent activities. To do so, set up alert in your mobile phone for every penny you spend and check your credit card bills monthly. If you notice any malicious activity, inform your credit card organization without any delay. So, cheer up! You've got the opportunity to save more by spending less by changing a bit of your lifestyle and certain items (as discussed here) are expected to help you do the same. Hence, you should make it a point to maintain healthy finances while avoiding debt as the year flows on. Is it possible to save considerable amount by trimming some of your expenses? Back-to-school - How can you shop successfully and send smart kids?